Box: 13.25" x 11" x 4.5"
Fine small English Regency lacquered papier-mâché tray with gilt ground and chinoiserie decoration. 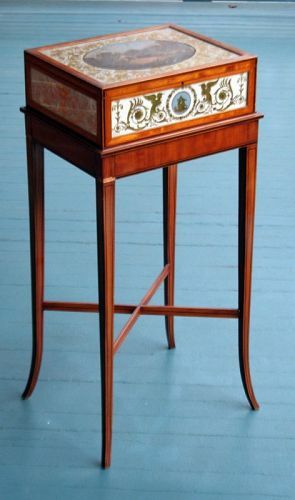 Circa 1815-30, on later custom made stand (minor losses to decoration). English Victorian Reading or Dictionary Stand: partially ebonized figured walnut and fruitwood, having a sloped bookrest supported by a ring and vasiform turned pillar and raised on four scrolling legs with ebonized turned finials and ending in porcelain castors. Circa 1880. Exceptional Small Scale Late Regency Sideboard in mahogany having a central section with a single drawer and a shaped splash board, flanked by two pedestals with a cabinet and a port drawer above and cabinet doors flanked by raised panel decoration below. English, Circa 1820-30. Fine Victorian Needlepoint Tilt Top Table in walnut having a circular top with floral needlepoint under glass, a turned and tapered pillar with carved leafage decoration and openwork scrolled legs. American or English, circa 1860. 32"h x 22 1/4" diam. Antique American painted tole tray with cut corners and handholds and with gilt stencil decorations on the gallery of leaves and flowers. Mid-19th century, now mounted on a custom stand. *Originally designed to hold sheet music, today this form is usually used to store books and magazines. Antique Late Federal Tilt Top Candlestand in walnut and cherry, having a rectangular, rounded corner top above a turned vasiform pillar and raised on downswept, tapered legs. American, Circa 1800. Diminutive George II Games Table (possibly a child"s table) in mahogany, having a double hinged rectangular top with outset squared corners, opening to a playing surface which opens to a storage well for playing pieces; the case with a straight apron and raised on turned straight legs terminating in pad feet. English, circa 1740-60. Fine antique English supper table in mahogany, having a circular, carved tilt top above a turned pillar and raised on cabriole legs with acanthus carved knees and pad feet. Circa 1840-60. Antique Regency four tier Etagere (or what-not) in mahogany, having a crenelated gallery and four flame form gilt finials, turned supports and feet, a medial drawer and a cabinet below . English, circa 1820. 69" h x 18 1/2" w x 14 3/4" d.